Intravascular catheter related infection (CRI) is one of the most serious nosocomial infections. Diagnostic criteria include a positive culture from the catheter tip along with blood, yet in many patients with signs of infection, current culture techniques fail to identify pathogens on catheter segments. We hypothesised that a molecular examination of the bacterial community on short term arterial catheters (ACs) would improve our understanding of the variety of organisms that are present in this niche environment and would help develop new methods for the diagnosis of CRI. The whole bacterial community presenting on all ACs was evaluated by molecular methods, i.e., a strategy of whole community DNA extraction, PCR amplification followed by cloning and 16S rDNA sequence analysis. Ten ACs were removed from patients suspected of CRI and 430 clones from 5 "colonised" and 5 "uncolonised" (semi-quantitative method) AC libraries were selected for sequencing and subsequent analysis. A total of 79 operational taxonomic units (OTUs) were identified at the level of 97% similarity belonging to six bacterial divisions. An average of 20 OTUs were present in each AC, irrespective of colonisation status. Conventional culture failed to reveal the majority of these bacteria. There was no significant difference in the bacterial diversity between the 'uncolonised' and 'colonised' ACs. This suggests that vascular devices cultured conventionally and reported as non infective may at times potentially be a significant source of sepsis in critically ill patients. Alternative methods may be required for the accurate diagnosis of CRI in critically ill patients. Intravascular catheters (IVCs) occupy a very important place in the day-to-day provision of healthcare in hospitals. Nearly 300 million IVCs are used yearly in USA alone . Along with their undoubted advantages IVCs are also associated with life-threatening infections . Every year, approximately 3,500 Australians  are diagnosed with catheter-related bloodstream infections and up to 400,000 cases occur annually in the USA . These infections are associated with a fatality rate of approximately 35%  and also significant increases the hospital stay [6–8]. Catheter-related infection (CRI) also contributes to the inappropriate and excessive use of antimicrobial agents and may lead to the selection of antibiotic-resistant organisms. Early detection and adequate treatment of causative pathogens within 24 hours of clinical suspicion of these infections (development of signs and symptoms) is critical for a favourable outcome, yet the majority of patients with suspected CRI yield negative diagnostic investigations, necessitating empiric, rather than optimal antimicrobial therapy . For example, in a study of 631 intensive care unit (ICU) catheters, 207 (33%) were removed due to clinical signs of CRI, yet definitive diagnosis from matched catheter and blood cultures was only achieved in 27 (13%), and catheter tip colonisation in 114 (55%) of suspected cases . The current laboratory techniques for diagnosis of CRI include qualitative culture of the catheter tips, semi-quantitative culture of the catheter tips, quantitative culture of catheter segments (including the techniques of sonication, vortex or luminal flushing before catheter culture), and catheter staining methods such as with acridine orange . These quantitative methods may have higher sensitivity, but are more time-consuming and complicated than semi-quantitive methods . The semi-quantitative method is still the most commonly used method in clinical microbiology laboratories around the world  and remains the recommended method for routine clinical microbiological analysis . The semi-quantitative method has however been criticised as regards its accuracy and delay of up to 2-4 days to provide culture results, therefore potentially delaying or missing the best treatment opportunity for patients with serious infections. Finally, the culture method is of limited value for slow-growing or fastidious bacteria, and for unculturable or intracellular pathogens, which can cause endocarditis (e.g. some Viridans Streptococci). The sensitivity of the semi-quantitative method may also be reduced if the patient is receiving antibiotic treatment. There is thus a need for the development of additional diagnostic methods to supplement conventional culture diagnosis, and molecular techniques have potential to fulfil this important role. Arterial catheters (ACs) provide continuous, real-time blood pressure monitoring, easy, and rapid blood specimen access and are the most heavily manipulated catheters in critically ill patients . It has been recently reported that the risk of AC-related bloodstream infections is close to that seen with short term central venous catheters (CVCs). Additionally AC colonisation rates have been demonstrated in critically ill patients to approximate those of short term CVCs . Thus although ACs have been traditionally thought to have a much lower risk of infection [6, 16–18] than short-term CVCs, this is no longer the case and current thinking suggests that they must be regarded with the CVC as a source of sepsis in critically ill patients . The primary aim of this study was to assess the bacterial community on short term ACs in critically ill patients using culture-independent methods and compare these results with bacterial species diagnosed by the roll-plate semi quantitive method. The secondary aim of this study was to compare the bacterial community on 'colonised' and 'uncolonised' ACs. This study is the first comprehensive examination of bacterial communities on the surface of short-term ACs in critically ill patients. The study setting was the ICU of the Royal Brisbane and Women's Hospital (RBWH), Queensland, Australia. This is a university-affiliated, mixed medical and surgical unit managing all forms of critically ill adult patients, except cardiac surgery and solid organ transplant patients. The unit is the sole referral centre for the management of severe burns trauma for the state of Queensland. During the study period (18 months), the ICU comprised 36 beds with admissions on average 2,000/annum. The mean (SD) patient Acute Physiology and Chronic Health Evaluation (APACHE) II score was of 16 ± 8.3 over this time period. Patient management was not impinged upon by the study. Intravascular catheter management including insertion and removal was at the discretion of the treating clinician. All catheters were managed using a standardised protocol. All AC (Leader Cath, Vygon, Ecouen, France) were inserted by experienced ICU medical staff using a Seldinger approach. Aseptic precautions for all device insertion included use of a full sized drape, mask, cap, gown and sterile gloves. Chlorhexidine 2% was used for skin antisepsis. Ultrasound guided placement was used where required. There was no imposed limitation on dwell time, and resite of ACs always occurred at a new site. Dressings and administration sets were maintained by dedicated ICU nurses (1:1 nurse patient ratio) using unit protocols and in accordance with best evidence practice. All ACs were removed on suspicion of CRI by clinicians independent of the study, using the following criteria: intravascular device in situ; 2 or more SIRS criteria (Temperature >38.5°C or <36.0°C, Heart Rate >90 bpm, Respiratory Rate >20 bpm or PaCO2 <32 mmHg or requirement for mechanical ventilation, White Blood Cells >12 000 cells/mm3 or <4000 cells/mm3 or presence of >10% immature neutrophils); and no other source of the sepsis evident. All catheter tips were handled under aseptic conditions and immediately, transported to the laboratory for analysis, where they were cultured by the semi-quantitative method . The cultivation and identification were performed by trained microbiologists in Microbiology Pathology Queensland-Central Laboratory, Australia. Ninety three short-term ACs from four access sites (65 radial, 15 femoral, 7 brachial and 5 dorsalis pedis), with a mean catheter in situ time of 6.0 days, from 82 patients with a mean age of 51.0 years old and APACHE II score of 21.0, were studied. The mean ICU stay was 18.6 days with hospital survival of 86%. The arterial catheter related colonisation rates were 15.0/1000 device days and catheter related bloodstream infections rates were 3.8/1000 device days. These rates reflect the selection of the cohort as those suspected clinically of catheter related infection. There were no significant associations observed between antibiotic usage and AC colonisation or bloodstream infections (p = 0.126). From this original cohort, 5 'colonised' and 5'uncolonised' ACs were randomly selected for further study (Table 1). The 5 colonised ACs comprised 2 mixed coagulase-negative Staphylococci, 2 S. epidermidis and 1 P. aeruginosa. No bacterial species were recovered from the uncolonised catheters using the semi-quantitive method. Comparison of the species richness, evenness, diversity of the 16S rRNA gene clones from two groups of ACs. Ethics approval for this study was granted by the Royal Brisbane and Women's Hospital Human Ethics Board (Protocol 2008/059) and Griffith University Human Ethics Board. The removal ACs were examined using the semi-quantitative method . This method is based on rolling a segment, usually the tip, of the removed catheter back and forth on 5% sheep blood agar plates (Oxoid, Australia) after removal. The plates were incubated at 35°C under aerobic conditions for 2-4 days. Microorganisms were then isolated and identified according to standard hospital protocol. Semi-quantitative tip culture was considered colonised if the plate grew ≥15 colony forming unit (cfu). If <15 cfu were grown, the catheter tip was considered to be uncolonised. Catheter tips were suspended in 200 μl of lysis buffer, which contained 20 mg/ml lysozyme, 20 mM Tris-HCl (pH 8.0), 2 mM EDTA, 1.2% Triton, and Proteinase K at 37°C overnight. After that, catheter tips were taken out and bacterial DNA was extracted using the QIAamp DNA mini kit (Qiagen, Australia). For each catheter, a control (unused) AC was taken from the original packaging and rolled back and forth on blood agar plates, with bacterial DNA extracted as above. Sixteen S rRNA genes were amplified from purified genomic DNA using the primers 8F and 1490R . For each 25 μl reaction, conditions were as follows: 3 μl of DNA template (concentration ranged from neat to 1:103), 2.5 μl of 10 × reaction buffer containing 20 mM MgCl2, 2 μl of 25 mM dNTPs, 1 μl of each primer (10 μM), 0.1 U of Taq DNA polymerase (Qiagen, Australia), 5 μl of 5 × BSA and 10.4 μl of sterile deionised water (sdH2O). Each PCR run contained a negative control (sdH2O instead of template DNA) and a positive control (E. coli instead of template DNA). For each DNA sample, three replicate PCRs were performed. Thermocycling was as follows: initial denaturation at 95°C for 5 min, followed by 30 cycles of a 1-min denaturation, 1-min annealing at 55°C and 2-min elongation at 72°C, all followed by a final extension of 10 min at 72°C. After purification using the Qiaquick PCR Purification kit (Qiagen, Australia), the PCR amplified 16S rRNA gene fragment were ligated into TOPO TA vector Cloning® system (Invitrogen, Ausralia) according to the manufacturer's instructions. Two microliters of the ligation mixture was transferred to 1.5 ml sterile tube which was with competent Escherichia coli TOP10 cells provided by the manufacturer. The mixture was chilled on ice for 20 min before heat shocking for 45 seconds at 42°C. The cells were suspended with SOC medium and incubated with shaking at 37°C for one hour. The transformed cells were then plated onto Luria-Bertani (Promega, Australia) agar plates supplemented with kanamycin (Sigma, Australia) and incubated at 37°C overnight. Ninety six of the resulting bacterial colonies per ligation were picked and grown overnight at 37°C on LB agar plates containing kanamycin. Plasmid DNA was released from bacterial cells by boiling and one microliter was used as the template in PCR with an M13 forward and reverse primers to determine the correct sizes of inserts. The presence and size of inserts was determined by electrophoresing the PCR products on a 1% agarose gel. Subsequently positive PCR products were purified, lyophilized and sent to Macrogen Inc. (Seoul, South Korea) for sequencing using ABI PRISM® BigDye™ and M13F vector-specific primer. The 16S rRNA gene clones of the arterial catheters were divided into two groups, i.e., uncolonised ACs and colonised ACs. The 16S rRNA gene sequences obtained were manually proofread, corrected and edited to start and end with the corresponding primer nucleotide (using reverse complement transform if necessary) using BioEdit . Sequences with incorrect inserts or with ambiguous bases were excluded from further sequence analyses. Vector sequences detected by cross match were trimmed off. Trimmed, assembled sequences were then aligned to a core set of sequences using the NAST alignment tool on the Greengens website (http://greengenes.lbl.gov/cgi-bin/nph-index.cgi). All 16S rRNA gene sequences were screened for potential chimeras using BELLEROPHON which was also available on the Greengens website  and sequences flagged as potential chimeras were discarded from further analysis. Sequences were compared to the NCBI GenBank database using the BLAST program. All examined 16S rRNA gene clone sequences and their most similar GenBank sequences which were not available in the Greengenes database at the time of analysis were identified from BLAST searches of sequences retrieved in this study and were then imported into the ARB software package (http://www.arb-home.de) . The Olsen corrected distance matrix was exported from the ARB program and all sequences were grouped into operational taxonomic unit (OTUs) by the furthest-neighbour algorithm Distance-based Operational Taxonomic Unit and Richness (DOTUR). DOTUR assigned sequences accurately to OTUs based on sequence data using values that are less than the cut off level . A cluster with less than 3% substitutions in the phylogenetic tree was usually matched with the same species or relatives in GenBank as confirmed by the RDP Classifier results. In this study, a similar cut off of 97% was defined as an OTU. This same cut off was used for diversity indices and richness estimates that were calculated by DOTUR. In this study, the Shannon and Simpson diversity indices, and Chao and ACE richness estimates were calculated by DOTUR to estimate microbial diversity and richness. Bacterial species evenness was also calculated . The Chao richness estimator curves were continuously calculated during the sequencing phase. When the estimator curve reaches a plateau, the sequencing effort was considered to be sufficient to provide an unbiased estimate of OTU richness, as proposed by Kemp & Aller . Rarefaction curve was generated by plotting the number of OTUs observed against number of sasequences sampled. The P value generated from two tailed t-test was used to determine significance of difference between different parameters. The partial 16S rRNA gene sequences were deposited in the GenBank database and assigned accession numbers GQ476157-GQ476573. Bacterial DNA was extracted from all ten ACs, regardless of whether they were 'colonised' or 'uncolonised' as defined by the semi-quantitative roll-plate method. These DNA samples were successfully amplified and used for constructing 16S rRNA gene clone libraries. No bacterial DNA was detected from negative control ACs which proves bacterial presentation on ACs. In the 16S rRNA gene clone library construction, 1,848 white colonies were identified including 926 from colonised ACs and 922 from uncolonised ACs. From these colonies, 980 (98 from each of the 10 ACs) were randomly selected, which accounted for 53.0% of the total clones. Among the clones, 430 clones were sequenced in total, obtaining 417 clone partial sequences. The lengths of the sequences for genetic comparison ranged between 771-867 bp, with an average for all the sequences of 808 bp. Most of the sequences matched a GenBank species or clone with an identity equal to or greater than 95% (396 out of 417). Chimera checks showed that all sequences were unlikely to be chimeric. All 417 sequences clustered into six groups (phyla or classes) according to the taxonomic classification of the NCBI database. These bacterial groups were Firmicutes, Alphaproteobacteria, Betaproteobacteria, Gammaproteobacteria, Unclassified_Proteobacteria and Unclassified Bacteria. 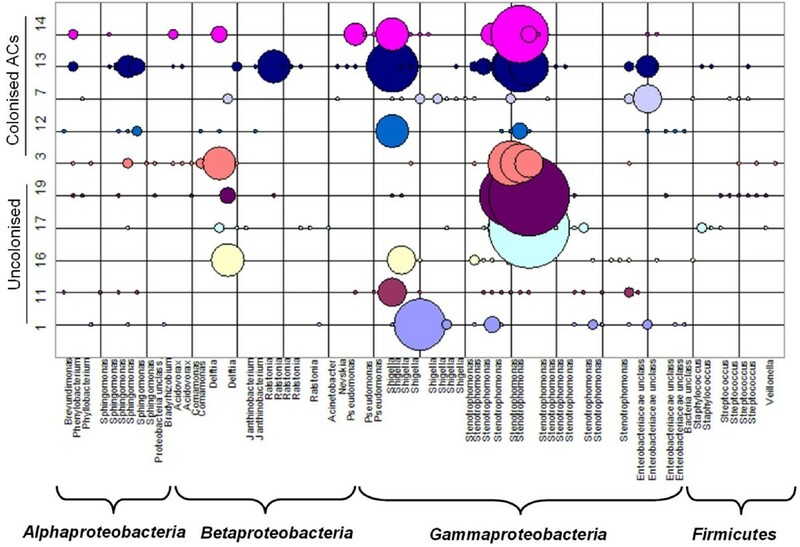 The single most dominant division was Gammaproteobacteria (75.0%), which included Xanthomonadales-subdivision (45.9%), Enterobacteriales-subdivision (24.5%), and Pseudomonadales-subdivision (4.6%), followed by Betaproteobacteria (12%) which were all within Burkholderiales-subdivision, Alphaproteobacteria (8%), Firmicutes (4%) including Staphylococcaceae-subdivision (1.5%) and Streptococcaceae-subdivision (2.5%), Unclassified proteobacteria (0.5%) and Unclassified Bacteria (0.5%). There were no significant differences between the uncolonised and colonised ACs in terms of the distribution of the taxonomic groups (Figure 1). 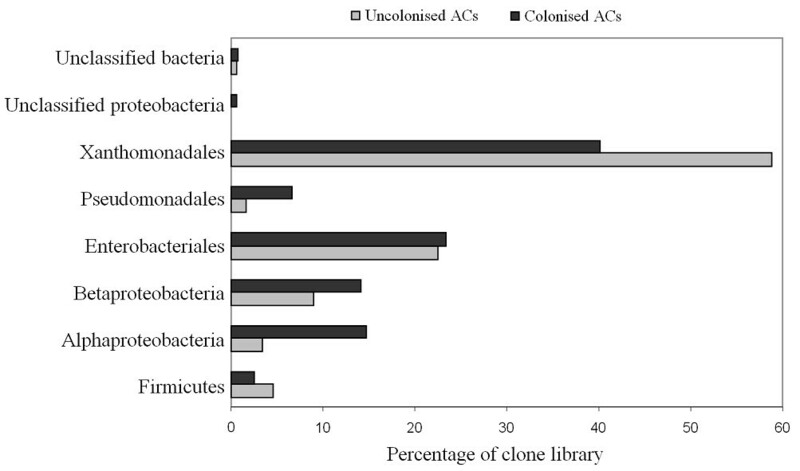 Firmicutes accounted for approximate 4.50% and 2.53% of clone libraries from uncolonised and colonised ACs respectively. Alphaproteobacteria accounted for 12% in colonised ACs which was four times more than in uncolonised ACs. Similar trends were seen in Pseudomonadales which accounted for 6.6% in colonised ACs and only 1.69% in uncolonised ACs. Colonised ACs contained more Betaproteobacteria/Burkholderiales (14.07%) than uncolonised ACs (8.99%). Similar proportions of Enterobacteriales, Xanthomonadales and unclassified bacteria were observed in both groups. The difference between the overall distributions of the taxonomic groups in colonised and uncolonised ACs was not statistically significant (p = 0.976). Division level distribution of 16S rRNA gene clone sequences in uncolonised and colonised ACs. All of 417 sequences were grouped into OTUs based on their genetic distance in a neighbour-joining tree with the DOTUR program. Using the furthest-neighbour method of calculation and a similarity threshold of 97%, DOTUR assigned the 417 sequences into 79 OTUs. There is an average of 20 OTUs from each ACs including uncolonised and colonised devices. Approximately one quarter of the OTUs (21) were composed of a single sequence. However, three OTUs contained 30 or more sequences. The majority of OTUs and sequences belong to the division Proteobacteria with 86.1% and 95.9%, respectively for colonised and uncolonised ACs. The largest three OTUs, a member of the division Gammaproteobacteria and family Xanthomonadaceae, contained 191 sequences (45.8%). Other common Proteobacteria OTUs indentified included Enterobacteriaceae, Pseudomonadaceae, Sphingomonadaceae, Comamonadaceae, Burkholderiaceae, Oxalobacteraceae, Caulobacteraceae, Phyllobacteriaceae, and Bradyrhizobiaceae (Figure 2). OTUs and sequences were also identified from the division Firmicutes (11.4% and 4%, between colonised and uncolonised ACs respectively) including species of the family Veillonellaceae, Staphylococcaceae, and Streptococcaceae. We also identified two novel OTUs that were < 93% similar to any sequences in GenBank. These two OTUs were 92% and 91% similar to unknown clones from environmental samples. Overall there were 51 OTUs for colonised ACs and 44 OTUs uncolonised ACs. There were 33 and 27 single- and double-sequence OTUs for colonised and uncolonised ACs. Of the 79 OTUs identified in the two sets of samples, 40 (50.6%) were identified in both groups. However, these 40 OTUs represent 339 of 417 sequences (81.5%) of the clones. There was no significant difference between the distribution of sequences generated from colonised and uncolonised ACs in OTUs (p = 0.316). Diversity of OTUs and their abundances in 16S rRNA gene clone libraries. The taxonomic identity of each OTU was identified by phylogenetic analyses of the partial 16S rRNA gene sequences after separating them into the major bacterial phyla. A total of 79 OTUs were shown but not all the species names were labelled. The total species evenness (E) for the colonised and uncolonised ACs was 0.81 and 0.88 respectively. The total microbial richness for colonised and uncolonised ACs were calculated and estimated by Chao and ACE. Chao takes into account singletons and doubletons, while ACE uses OTUs having one to ten clones each. It was observed that OTU richness would increase with additional sequencing of clones. 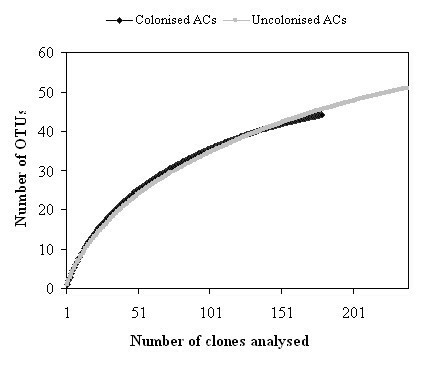 Both the Chao and ACE estimation for uncolonised ACs clone libraries were slightly lower than colonised ACs clone libraries (Table 1). As ACE and Chao are dependent of the amount of singletons, the discrepancies with the diversity indices are most probably due to different amounts of singletons in the clone libraries. From observed and estimated total richness for uncolonised and colonised ACs, we estimated that there was a minimum 5-10 more OTUs per group yet to be uncovered. However, it should be noted that no complex microbial community has even ever been sampled to completion. Rarefaction curve analyses (Figure 3) indicate that our sampling of clones is sufficient to give an overview of dominant microbial communities on the examined uncolonised and colonised ACs. Rarefaction analysis of 16S rRNA gene sequences. All sequences were obtained from uncolonised and colonised ACs clone libraries using an OTU threshold of 97% identity. To estimate the relative diversity using 16S rRNA gene for colonised and uncolonised ACs, we calculated both Shannon and Simpson Diversity Indices, measures of ecosystem biodiversity. Each diversity index is associated with specific biases. The Shannon index places a greater weight on consistency of species abundance in OTUs, while the Simpson Index gives more weight to the abundance of OTUs. The Shannon's diversity index H' values for colonised and uncolonised ACs were 3.20 and 3.31 (Table 1). The Simpson diversity index values for colonised and uncolonised ACs were 0.93 and 0.95. Both indices suggest similar diversity profiles for both colonised and uncolonised ACs. The largest OTU from the colonised ACs contained 54 sequences and the OTU from the uncolonised ACs contained 26 sequences, which might explain the slightly lower diversity index values in colonised ACs. While these results suggested that the diversity indices in uncolonised ACs was slightly higher than colonised ACs, there was no significant difference between the two groups (p = 0.986). Culture-independent methods have been successfully and widely used to reveal the microbial community in environmental and human samples [27–29]. Among these methods, the 16S rRNA gene clone screening approach provides a direct method for investigating bacterial diversity [27–29]. This study is the first attempt to use 16S rRNA gene clone screening approach to assess the bacterial community on surfaces of ACs taken from critically ill ICU patients with suspected catheter related blood-stream infections. The results revealed a remarkable diversity of bacteria on ACs. It is generally believed that coagulase-negative staphycocci (such as Staphylococcus epidermidis) and Staphylococcus aureus, a subvision of phylum Firmicutes are the most dominant bacteria found in ACs although the infection rates might vary with different catheter insertion sites [30, 31]. However, in this study the majority of sequences on ACs were from the division Gammaproteobacteria. The single most dominant subdivision was Xanthomonadales (Stenotrophomonas maltophilia). A large number of bacterial clones in the libraries were from Enterobacteriales, Pseudomonadales and Burkholderiales which all contain pathogenetic species. Many of these bacteria are difficult to cultivate. Many of the examined clones were also closely related to known pathogens or opportunistic pathogens, but they were not identified by the semi-quantitative method. These sequences are the closest neighbours of Staphylococcus epidermidis, Staphylococcus capitis, Streptococcus pyogenes, Streptococcus agalactiae, Stenotrophomonas maltophilia, Delftia acidovorans, Escherichia coli, Shigella flexneri, Comamonas testosteroni, and Brevundimonas diminuta. Impressively, over 45% of clones examined in this study were Stenotrophomonas maltophilia. Over the last decade, Stenotrophomonas maltophilia has been documented as an important agent of nosocomial infection, including bloodstream infection, and has been associated with high mortality (26.7%) [32, 33]. It was the third most frequent non-fermentative Gram-negative bacterium reported in the SENTRY Antimicrobial Surveillance Program between 1997 and 2001 . Several reports on catheter-related bloodstream infections caused by Stenotrophomonas maltophilia exist [32–34]. Stenotrophomonas is increasingly recognised as a very important pathogen in the critically ill patient. In particular, it may become problematic in long stay patients who have been exposed to broad spectrum antibiotics. In this regard our result describing the abundance of this organism on ACs may have additional importance. In our ICUs this pathogen is not infrequently seen in this context, and treatment may be difficult due to resistance. Shigella species were also identified from both colonised and uncolonised ACs in this study. For a long time, it was believed that Shigella species were confined to the bowel and cause Shigellosis. However, several reports have now appeared in the literature of Shigella bacteraemia [35, 36]. Shigella bacteraemia is still very rare and the mechanism of bacteraemia by Shigella species remains unclear . Shigella was not however reported as a cause of bacteraemia arising from ACs. Delftia acidovorans, a bacterium known to be resistant to a class of drugs commonly used to treat systemic gram-negative infections (aminoglycosides) [38, 39], was also identified in this study. Timely identification at species level is necessary to determine the most appropriate antibiotic therapy . The results of the culture-dependent (semi-quantitive) and culture-independent (molecular) methods appear incongruent. Whereas semi-quantitive method reported the most frequently isolated bacteria from intravascular catheters as coagulase-negative staphylococci and staphylococcus aureus[16, 40], our molecular data analysis from 16S rRNA gene clone sequences presented Stenotrophomonas maltophilia as the predominant bacteria. There are several reports of discrepancies between culture-dependent and culture-independent approaches for bacterial community studies [29, 41, 42]. Culture dependent methods bias bacteria who favour the growth media and grow fast under standard laboratory conditions. In addition, some bacterial species may compete with others for nutrients or they may even inhibit other bacteria from growing [20, 41, 43]. Unlike the semi-quantitive method, which only examines bacteria on outer surfaces of catheters, the molecular method used here enables assessing bacteria on both inner and outer surfaces of catheters. Together these factors might help explain variations of the bacterial community examined by these two methods. Compared to culture-dependent methods, culture-independent methods provide more comprehensive information on the bacterial community. The knowledge gained from this study may be a beginning step in improved understanding of pathogenesis and infection risks for critically ill patients with intravascular catheters. Replication of this study in other settings, as well as exploring the relationship between type and timing of commencement for antibiotic therapy, and diagnostic results, are important areas for future research. This study of critically ill patients with suspected CRI, has demonstrated that both colonised and uncolonised ACs examined by molecular method have an average of 20 OTUs per catheter, most of which are not isolated by the semi-quantitative method. Overall there were 79 OTUs in the two sets of samples which comprised 51 OTUs for colonised ACs and 44 OTUs uncolonised ACs. Of the 79 OTUs identified in the two sets of samples, 40 were identified in both groups. Statistically there was no significant difference in bacterial composition between uncolonised and colonised ACs, as confirmed by the results of t-test of taxonomic group distribution, the OTU distribution, and diversity indices. Taken together, this study suggests that in vascular devices removed for suspicion of CRI and analysed using semi-quantitative method, a negative culture result may not be indicative of non infective catheters. Moreover, these culture negative catheters may at times be a significant source of sepsis in critically ill patients. Whilst the clinical significance of these findings requires further study before any such conclusions may be drawn, the results suggest a need for the development of new methods that more accurately determine the presence of pathogens on intravascular devices. The first author is supported by NHMRC training clinical research fellowship, Australian Government grant number 597491. The research was supported by GUNRG and GMRC grants from Griffith University, Australia. We thank Narelle George and Dr. Graeme Nimmo, Microbiology Pathology Queensland-Central Laboratory for their assistance in the culture portion of this study. LZ performed all molecular work, data analysis and drafted the paper. JG collected the clinical samples and provided the clinical data. LZ, CR, KS, DM and JG participated in the design and coordination of the study and editing of the manuscript. BP participated in the design of the study. All authors read and approved the final manuscript.